For a non-religious guy, I became fascinated by religious art in college. Specifically, I was enamored with Italian Renaissance and medieval art and architecture. Spending an hour or two per day in a dark classroom, looking at slides of the Virgin Mary, Christ, crucifixions and the churches and cathedrals that housed them made me happy. When I traveled to Italy after college graduation, suddenly it was as if the pages of all those art books were coming alive. I was finally able to walk through the naves I'd studied, and admire my favorite altarpieces and frescoes in 3-D. It almost made me want to go back and look at schools for architecture. Visiting Rome was a no-brainer for me then, and I'm thinking about a return for 2012. Without further ado, here are my top three architectural highlights of the Italian capital. The Colosseum is the #1 symbol of Rome, if not all of Italy. 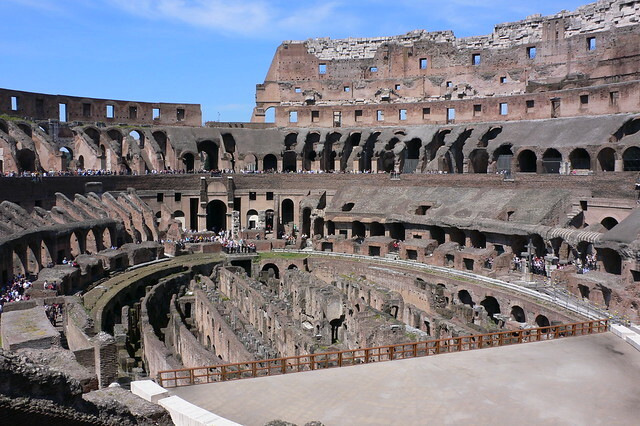 Construction on the Roman Empire's largest amphitheater began in 72 AD, and was completed within just 8 years, by 80 AD. Despite earthquakes over the centuries, it has maintained its form, which is a testament to the engineering involved in constructing it. The ancient stadium was used to host fights between gladiators. The lack of original flooring allows modern day visitors to see the maze of hallways that rested underneath the area used for fighting. In the movie Gladiator, for example, tigers are shown to be released through false doors in the ground. While not as well known or recognized as the Colosseum, the Pantheon is another testament to ancient architecture and engineering. It was commissioned as a temple to the gods of Rome, and built around 126 AD by Emperor Hadrian. The main building is circular, and there's a Greek-style portico attached with 3 rows of 8 Corinthian columns. The building has been repurposed often over its 2,000 year history. It currently contains the tombs of famed Renaissance painter Raphael, as well as several Italian kings. My favorite aspect of the Pantheon is the coffered dome, which has a circular opening at the top that allows a small stream of light to shine in the otherwise dark interior. The Pantheon's dome is still the world's largest unreinforced concrete dome. 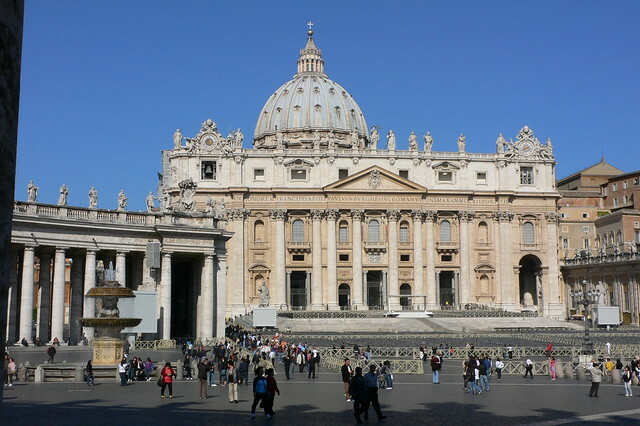 Technically located within the Vatican City, St. Peter's Basilica has the largest interior space of any Christian church in the world. And that's what I remember most about walking in the front door — just how small I felt in comparison to its size and grandeur. I craned my neck up to see streams of white light shooting down diagonally from the upper windows. Unfortunately, when I visited in 1998, the entire front facade was covered in scaffolding as restoration work was being done. Still, the interior is far more fascinating. And every visitor should take the opportunity to climb up the narrow, curved staircase that winds around the dome. From the upper cupola, visitors are afforded sweeping 360-degree views of the Vatican City and Rome. Funny. I’m going to be in Rome in 2 days. Thanks for the tips!